Kids always like to have fun during the winter when there is snow outside. Snow fights can be a bit demanding and no one likes getting hit all the time. If you are looking to get ahead in a show fight, you can consider getting some gear which will surely turn the odds in your favor. A snowball launching crossbow will guarantee that you are the one doing the hitting and that your foes will think twice before even attempting to throw something at you. The fact that it looks like a crossbow makes it very intimidating and the psychological factor can be very important in every war, even if it is just a simple snow fight. The sides can easily fold so that the player can run and chase with more ease and comfort; once he reaches his target, he can easily deploy the weapon, aim and shoot. The basic principle is very simple and it works just like a slingshot, only more intimidating. You just have to pull back and let go; the only problem is that you still have to make the snowball and put it in the crossbow so this method might take more time but it is also much more fun. 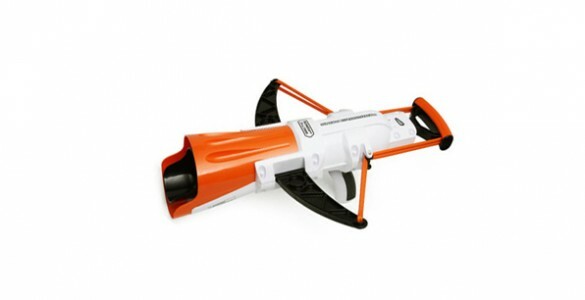 The real value of this snowball crossbow is that it can be the perfect gift during the winter. It is for ages 8+ so everyone can have fun with it, not just the kids. Image the look on the small boy when he gets this as a gift. Buying one before the other kids get it can be a big advantage in future snow fights and the affordable price makes it a very cool gift. While it may seem important to have snow for the snowball launching crossbow to work, the truth is that you can put almost anything in it and launch it where you wish. This means that it is not just fun during the winter but actually during the whole year. It looks cool, it is easy to use, it is affordable and it is very fun, all in all, it is a very cool gift.